You will venture around this wheel, and the elements that sit in each cardinal direction. In doing so, you will be introduced to the sprits of the land in which this teaching is taking place. You will learn directly from these teachers, in woods where there is very little human interference and whose spirits have been well fed for several years now; by both our work and visiting indigenous elders. This will ensure that we begin where we mean to continue from, a well grounded place, connected to the spirit of the land and time (as well as the timelessness) of now. You will also begin another important aspect of this work, which is to reconnect and begin to heal the ancestral lineages that you carry. Until we heal these lines, and begin to work with them, any subsequent shamanic work undertaken will not have the same power. It is our immediate ancestors that are the first step into the invisible worlds, and who ultimately lead back, through the elements, to the original ancestor, that ineffable spirit of life. And finally you will be introduced to the power that is at the heart of all shamanic work; that of ceremony. 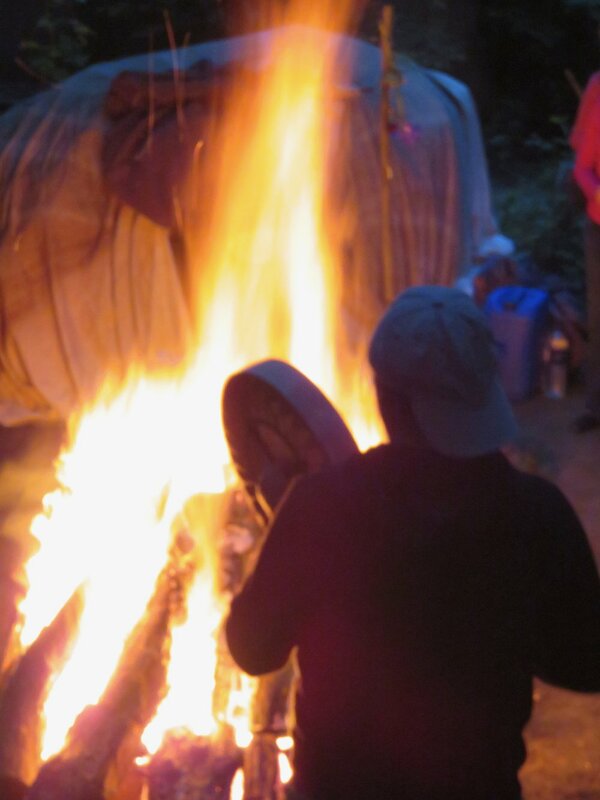 You will be challenged through ancient rites; embracing the fire in a Sacred Fire Dance; joining in community and prayer in a Temascal (sweat); experiencing a night alone in nature in Sitting out Ceremony and spending a night deep in our Mother Earth with a Burial. Each of these initiations will take you closer to the mysterious world of the shaman whilst uncovering the hidden layers of your souls. On this shamanic journey of death and rebirth, you will emerge refreshed, re-invigorated and in touch with the raw intensity and power of life. Embracing humour and honesty, lightness and intensity, inner journeying with outer action and living close to and in harmony with nature, we will create a circle of trust and beauty; one that will support this magical journey deep into the world of the shaman. The Seed Sprouts. The rising sun. Birth and Rebirth. Spirit and imagination. Potential. Seeding our life with passion, the spirit of expansion and adventure. Aggression, pride and will as sources of strength. The hearth fire. The desire to be born, to live and to burn bright. Playfulness, the magical child and the hero’s/ heroin's quest. The spirit of the Warrior, he/ she that protects and serves. and get to know our spiritual allies in a visceral way. We will also undertake a sacred fire ritual and connect to our ancient ancestral heritage, embracing the fire deep into our souls and moving beyond the masks of self deception and false posturing to discover, express and release our true spirits. The Seed Blossoms and Bears Fruit. The river of life. Nurturing and guiding us on our journeys. Love and grief as praise of life. Our ability to truly taste life through our emotions. The ebb and flow, changing tides. Letting go, letting flow. Receptivity. Interconnectedness of everything. Love. Dreams and visions, psychic awareness. The blood. Family. Ancestral ties and ancestral wounding. Our commitment and responsibility to ‘all of our relations’. Learning from the above and more, we will dive deeply and drink of the sacred wellspring of life. We will join together, in community, in a Sacred Sauna to gift back to the earth our sweat and tears, so that they may seed further life. We will listen and align our own heartbeats with the heartbeat of the earth, giving and receiving love as we learn to walk in beauty. The Seed Releases, Flying Free. The breath of life. The wind. That which connects us to the invisible realms of spirit. Eldership. Wisdom and gratitude. Wise counsel. Responsibility. Freedom. Truth. Change. Transformation. The Magician who can alter reality and destiny. Vision. Knowing and honouring our sacred place on the earth and the duty we have to perform here. We will explore the above. You will undertake a Sitting Out ceremony, spending a night alone in nature, seeking a vision that you can live by- to give your life purpose and direction. You will look to understand your place as masters of your soul, able to steer the nature and pathways of your lives through conscious decision making. You will also explore the nature of our subtle energetic 'dreaming bodies' and how these feed our perceptions of reality. The Seed Re-Seeds the Earth. The circle ends before beginning again. Death and Rebirth. Containment, manifestation. Our instincts. That which 'matters', has value. Acceptance of limits and defining oneself through limitation. Meeting and befriending fear. Leadership and Responsibilty. Mastery The wisdom and healing gifts of the earth. Nature’s medicine. Nature spirits. Sensuality, the enjoyment of ourbodies. The wild, untamed essence of our earthly and animal natures. In service to and in guardian of the natural world. We will explore all of the above. You will undertake a sacred burial ceremony, spending a night deep in the darkness and womb of the earth, seeking visions and facing your death: the ultimate definition of life. Merging with your animal spirit helpers we will learn what they have to teach about our instinctual and wild, free natures. Gaining perspective on your journeys so far and committing to your new paths, having been touched and changed forever by spirit, we will end with celebration, feeding the desire to give back to our mother, the earth, all that you have been given through the sacred, delicate gift of our lives.